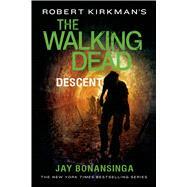 Written by Jay Bonansinga, based on the original series created by Robert Kirkman, The Walking Dead: Descent follows the events of The Fall of the Governor, and Lilly Caul's struggles to rebuild Woodbury after the Governor's shocking demise. Out of the ashes of its dark past, Woodbury, Georgia, becomes an oasis of safety amidst the plague of the walking dead - a town reborn in the wake of its former tyrannical leader, Philip Blake, aka The Governor. Blake's legacy of madness haunts every nook and cranny of this little walled community, but Lilly Caul and a small ragtag band of survivors are determined to overcome their traumatic past... despite the fact that a super-herd is closing in on them. This vast stampede of zombies, driven by inexorable hunger and aimed directly at Woodbury, becomes their first true test. But Lilly and company refuse to succumb, and in a stunning counteroffensive, the beleaguered townspeople save themselves by joining forces with a mysterious religious sect fresh from the wilderness. Led by an enigmatic preacher named Jeremiah, this rogue church group seems tailor made for Woodbury and Lilly's dream of a democratic, family-friendly future. The two factions meld into one, the town prospers, and everything seems hopeful for the first time since the plague broke out. But things - especially in the world of the walking dead - are often not what they seem. Jeremiah and his followers harbor a dark secret, the evidence of which very gradually begins to unravel. Along with a popular TV show also based on Kirkman's AMC comic books, The Walking Dead franchise is just getting better and better with Bonansinga's newest novel. In a stunning and horrifying finale, the world for Lilly and her close friends is turned upside down, and it is solely up to Lilly Caul to cleanse the town once and for all of its poisonous fate. These novels continue to be a great companion for fans of the television series and graphic novels!